This season hasn’t been necessarily one to remember for the officials, players, and fans of Maccabi Fox Tel Aviv, one of the most prestigious clubs not only in Israel, but in all of Europe. The 2016-2017 campaign was a rock-bottom of sorts in the newly revised Euroleague. They finished the season 10-20, placing them 14th overall in the standings (out of 16). Not only did they finish miles out of playoff contention, but were out of the discussion early, as their playoff hopes seemed doomed by Round 20 or so of the regular season. Compounding this lack of success in 2016-2017 is the fact that two years ago they were coming off arguably their worst Euroleague campaign in the history of the club, as they failed to qualify for Top 16 play in the “old” format, and failed to make the postseason in the Eurocup as well. Things haven’t been much better in the “Winner” League (i.e. Israeli Basketball Super League, BSL for short). Tel Aviv finished 19-14, good for fourth place in the standings. Granted, a playoff berth and finishing in the upper quarter of the Winner League may be good for most Israeli clubs. But for a club with the kind of history as Tel Aviv, those results “disappointed” fans and management alike. Because of the lackluster results in Euroleague as well as Winner League play, the organization has been a hurricane roster and coaching-wise. Since David Blatt left for the Cleveland Cavs after winning a Euroleague title in 2014 (he now is with Darussafaka but should be leaving after Dacka lost the Dogus sponsorship and will be regulated to the Eurocup), Tel Aviv has gone through six different head coaches (Guy Goodes, Zan Tabak, Erez Edelstein, Rami Hadar, Ainars Bagatskis, and now Arik Shivek). Only Goodes (a long-time assistant under Blatt and former Tel Aviv player) lasted a whole season (he was fired early in his second season). Player-wise, Tel Aviv has swung for the fences on big-name free agent, American players, only to strike out more often than not. Jordan Farmar flamed out two seasons ago. Sonny Weems failed to live out his promise to be “Maccabi’s LeBron”. Maik Zirbes ended up getting loaned out to Bayern Munich mid-season. And though Andrew Goudelock has put up big scoring numbers, it’s questionable if he will be back next year considering his defensive liabilities. And yet, despite these problems, and finishing the Winner League by firing Bagatskis, who seemed like a dead man walking nearly a month ago, things have turned around in Tel Aviv. They were the first team to qualify for the semifinals by sweeping Bnei Herzliya 3-0, and they could luck out in their semifinal matchup if Maccabi Haifa pulls of the upset against top-seeded Hapoel Holon. Add that with the problems of other big-time club Hapoel Jerusalem on the other side of the bracket (Jerusalem is one game away from being eliminated by 6th-seed Ironi Nahariya), and it appears that Tel Aviv may be on their way to another Winner League title run, something that seemed unthinkable a couple of weeks ago when morale was at an all-time low. Tel Aviv has been helped by two major developments: the hiring of Shivek, and the emergence of Quincy Miller, who finally is fully healthy and has been given a real opportunity to shine for the first time all season. Shivek was hired on after the Bagatskis firing to somewhat keep the ship afloat at the conclusion of what was originally seen as a “lost” season. 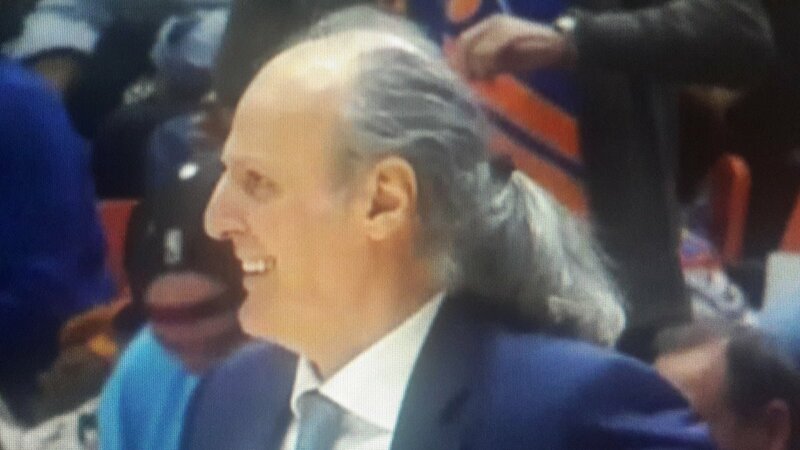 Shivek, at 60 years old, is an Israeli coaching basketball veteran, who previously coached the Israeli National team (2009-2014) and Maccabi Rishon. At Rishon, Shivek found a lot of immediate success, as he won the Winner League title last year in first season with the club, and also helped club qualify for the quarterfinals in the FIBA Europe Cup as well. Shivek also has coached beyond Israel as well, with brief coaching stops in Antwerp and Amsterdam. Though he doesn’t have much big-name recognition with European basketball fans, he is quite respected in coaching circles. Most notably, he is quite active on the clinic circuit, known for his theories on developing young guards. In fact, there is a video sponsored by FIBA of him conducting one of his clinics on the subject. Considering the pedigree of coaches who have appeared in such videos (from NBA to European coaches), the clinic below shows that Shivek has some clout in the European coaching community, which should explain some of his early success with Tel Aviv this postseason. But how has Shivek been different from Bagatskis, Hadar and Edelstein this season? Mostly on the defensive end, as Tel Aviv has been a much better defensive unit under Shivek this postseason. Though they scored a league high 84 ppg, they also gave up 80.6 ppg, which would put them in the lower half of the league. In their 3-game series against Ironi, they only gave up 68 ppg, while scoring 93 ppg. (A differential of 25 points!) While it is just one round, Shivek is doing some things with this club that none of the three previous coaches could do on the defensive end and that could be key to whether or not they take back the Winner League title. While Shivek’s arrival has been a breath of fresh air this postseason, the return of a healthy Quincy Miller has been key as well to Tel Aviv’s playoff success. Miller, who was coming off a stellar European debut with Crvena Zvezda last year, was expected to be a key player that club could depend on along with Weems. However, an injury in the off-season during pickup sidelined Miller for most of the season, which proved to be a huge blow to the club. Though Miller did try to make comebacks at various points in the season (both in Euroleague and Winner League play), he hasn’t really been a 100 percent until now. Of course, just being healthy is one thing. Miller made his Winner League debut in Round 27, and Bagatskis rarely utilized him when the forward returned. He only played more than 20 minutes once (A Round 30 loss against Nahariya where he played 22 minutes and scored 9 point), and even when he was in, it was obvious that Bagatskis wasn’t comfortable with him in the rotation, preferring other options like Sylvan Landesberg and Victor Rudd instead. However, Shivek has loosened the reigns on Miller, allowing him to be the athletics and at times dominating two-way player that he was in Belgrade a season ago. Miller has averaged almost 23 MPG in the three game series, along with 17.3 ppg, 6.0 rpg, 1.7 spg, and a PIR average of 22.7. Miller showcased his stroke in the three game series, as he shot 70 percent from beyond the arc (7 of 10). While it is not expected that he will shoot that good a percentage again in the following rounds, it is a good sign that Miller is once again thriving and finding his rhythm as a scorer this postseason, something that never really came into fruition at any point for him during the regular season under Bagatskis. There still is a lot of playoff basketball to be played in the Winner League and in Tel Aviv. Though this three-game stretch has been a godsend for the club and fans who have experienced nothing but turmoil until this point, it is still a small sample size. Maccabi Haifa, if they pull off the upset, is no regular 8th seed, as their +128 point differential was actually the second-best mark in the Winner League. (And better than Tel Aviv’s). And while Tel Aviv is clicking on all cylinders now, it has been a common theme this year for this club to click for a few games, only to fall back to mediocrity. Hadar and Bagatskis both showed signs that they had this club on the upswing, only to fail after a few games. The same could happen under Shivek. Whatever happens, it will be interesting to see if the positive momentum Tel Aviv has built so far can be built upon for next year. While the club has maintained continuity with Israeli players like Guy Pnini and Yogev Ohayon, and foreign vets like Devin Smith and Landesberg, it is obvious that this club has to make some changes to make this club better in the long-run, as those vets are starting to show signs of their age (well…maybe not Landesberg, but he may need a fresh start somewhere else). Tel Aviv has tried to go with big-name signings, but they have failed to mesh chemistry-wise, and they either were jettisoned by the club or left on their own accord in a season or less. If Tel Aviv wants to recapture the glory they had before (or at least be competitive in the Euroleague again), they will need to settle on a style and system, and try to find players that will fit that ideal, rather than just go with big names who put up big numbers (i.e. Weems, Goudelock, etc.). However, will Tel Aviv management settle on Shivek and Miller to lead that new movement? Shivek is only signed through the remainder of the season, and Tel Aviv is holding out hope that they will be able to sign a big name such as Zalgiris coach Sarunas Jasikevicius, Blatt or perhaps Georgios Bartzokas, who may be on his way out after one disastrous season in Barcelona. But is ANOTHER coaching change really what this club needs? And if so, will any of those big names actually consider Tel Aviv after all the coaching turnover the past two seasons? As for Miller, he is signed for one more season, and he may be their best building block, as he offers two-way versatility that no other player on the roster possesses. Will Tel Aviv try to build around him, with good complimentary players, or will they continue to do their reckless approach to team building which has produced nothing but mediocrity the past couple of seasons? There are a lot of questions facing this Tel Aviv club this offseason. With only 16 spots, there are so many pressures on clubs on an annual basis to remain in the Euroleague. There is pressure to keep high attendance. There is pressure from fans to win. There is pressure from fans to make the playoffs. There is pressure from fans to make the Final Four. These all are stark realities with a club like Maccabi Tel Aviv, and these realities are reasons why Tel Aviv is always seeking change as an organization, even if it is to their detriment, as it has been the past two seasons. However, if Miller and Shivek can continue this Tel Aviv postseason success, and perhaps capture an unexpected Winner League title, then maybe the solutions to “rebuilding” Maccabi Tel Aviv won’t be as difficult as initially imagined.